To prevent end users from changing Veeam backup agent job settings, and performing restore, you can enable read-only access mode. In the read-only access mode, Veeam backup agents can be managed only in Veeam Availability Console. The Veeam backup agent Control Panel section displays a notification saying that the product is managed by a system administrator. Other operations are not available for end users. When you install Veeam backup agents using discovery rules, or initiate Veeam backup agent installation in Veeam Availability Console, the read-only access mode is enabled by default. You might need to manually enable the read-only access mode only if Veeam backup agents were installed outside Veeam Availability Console (for example, using GPO), or if for some reason you chose not to keep the default access mode settings when installing Veeam backup agents. 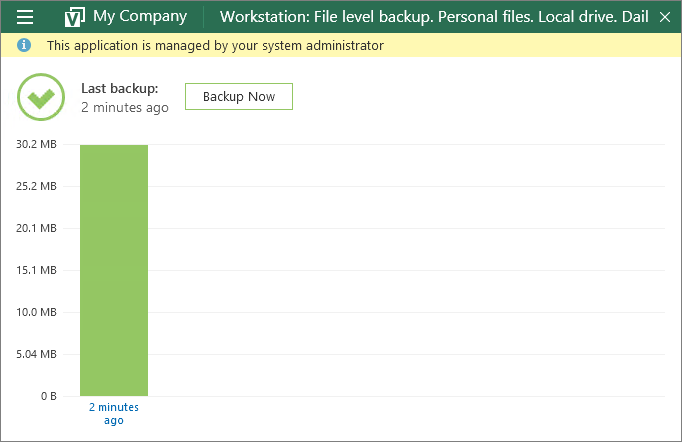 Select one or more Veeam backup agent jobs in the list. To display all Veeam backup agents running in the full access mode, click Filter, in the Filter backup agents by UI mode section select Full and click Apply. At the top of the list, click Agent UI Mode and choose Switch to read-only UI. To display all Veeam backup agents running in the read-only access mode, click Filter, in the Filter backup agents by UI mode mode to display section select Read-Only and click Apply. At the top of the list, click Agent UI Mode and choose Switch to full admin access.